The second reason to use a FLAC splitter such as Total Audio Converter is to take your FLAC file and turn it into an MP3. Although FLAC is an excellent file format, it is not compatible with most hardware on the market, which prefers the MP3 file. MP3 files are smaller but do not hold the same quality as a FLAC file. However, because MP3 files are smaller than FLAC, they are preferred by most manufacturers. Using a FLAC splitter allows you to choose to store your split FLAC file as an MP3 in the process. Step one: Download Total Audio Converter. Simple to use, this audio file converter also allows you to split APE files. Step two: Insert CD and select the files you require split from those listed. 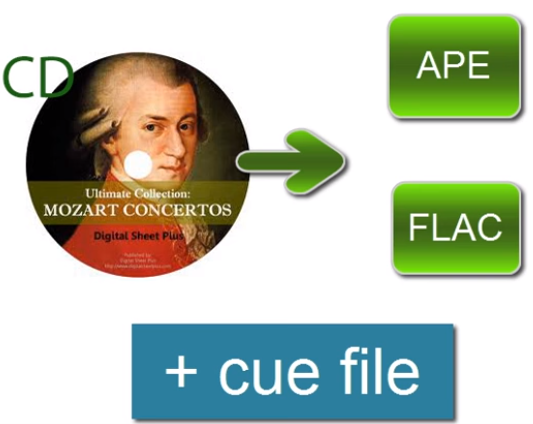 The CD is a single FLAC file but includes the CUE file, which says when individual tracks begin and end. Step three: Select your FLAC file from the menu tree. This file should be under ‘My Music’ or under the ‘CD’ drive letter. Step four: To maintain the quality of the FLAC file you can click on FLAC at the top. However, if you want to play this on most devices, select MP3. This is a smaller file and therefore offers less quality of sound. Step five: Choose your destination and skip to split by CUE and tick the box ‘split file using CUE-file information’. Step six: You will be shown the album info. Make sure the tracks are displayed in the appropriate encoding region for where you live. This will impact how the track information is shown. Step seven: Choose the fields that will be displayed with the track. It is often useful to maintain the default template here. Step seven, click the start button, and you are pretty much done. It is that easy. If you want a step-by-step demonstration of these steps, head over to this video, and we can talk you through it with screenshot demonstration. Remember, splitting a FLAC file gives you the power to make your own mix of music. Perfect for those romantic gestures to a loved one – bring back the mix-tape we say – or at least the mix digital audio file.